Ever since its IPO, the fear of how mobile would impact Facebook’s business model has been baked into its stock price, holding it down. The results from Facebook’s most recent quarter vanquished those fears, sending shares of the world’s social network 30% higher. To investors, the key stat was that 41% of the company’s revenue was generated from mobile advertising. Yet, even as Wall Street celebrates Facebook’s mobile ad triumph, there’s reason to believe that some advertisers expect more. Facebook won over Wall Street by transitioning to mobile at a pace that kept up with its user base. Meanwhile, some of its chief competitors in display advertising, like Microsoft and Yahoo, are still stumbling to catch up. The beauty of Facebook’s transition is its simplicity. It didn't re-imagine itself for a new generation of mobile computing. It avoided this hyperbole of design and simply bolted its desktop interface onto mobile. As it turns out, the infinitely scrolling “feed” is just as good a user experience on mobile as it is on desktop. The migration of the newsfeed from desktop to mobile has helped Facebook all but monopolize time spent on Androids and iPhones. 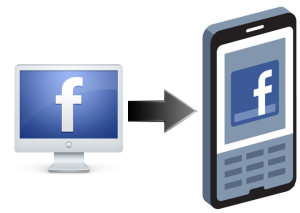 According to comScore, time spent on Facebook mobile doubled year over year, from 111 billion minutes to 220 billion! In fact, time spent on social is by far the number one behavior on mobile devices, accounting for an astounding 32% of all minutes. For advertisers, Facebook equates to a sure-fire way to reach their target audience on mobile with scale. Yet, few advertisers actually view Facebook as a mobile solution. In fact, advertisers rarely dictate how they want their funds allocated across mobile or desktop. Instead, Facebook simply places ads on both platforms and then shifts the investment according to performance. Is this lack of specific demand for Facebook mobile a crack in the armor of the 41% revenue number? Or is this dual platform approach the correct way for advertisers to manage display? The latter seems to be gaining momentum, as evidenced by Google’s transition to a similar approach for its paid search product. Yet comparing Google and Facebook’s “platform agnostic” approach reveals a key deficiency in Facebook’s mobile ad suite. Google’s advertisers see value in adjusting the ad experience based on context. Factors like daypart, location and device dictate the message and functionality of the paid search results. For example, a mobile search for “pizza” at midnight in the downtown neighborhood will look completely different than that same search at a desktop at noon from the suburbs. The same is not true for Facebook. To the best of my knowledge, advertisers approach Facebook with a one-size-fits-all-platforms mindset. The one notable exception is the ad product dedicated to acquiring app installations, which tailors the message and functionality (click to app store) based on mobile. Other than that, there is a notable dearth of Facebook ad products that capitalize on the uniqueness of mobile. For now, Facebook’s mobile revenue relies chiefly on ad products designed for desktop. That may be good enough for Wall Street but Madison Avenue will soon demand more.